- to develop logical means to let description vary with such degrees of refinement. The first task is formalised by means of an inverse systems of first order models, with reality appearing as its inverse limit. The second task is formalised by means of so-called conditional quantifiers, a new form of generalised quantification which can best be described as resource bounded quantification. We show that the logic provides for a semantics and pragmatics of direct perception reports. In particular, direct perception reports have a possibly nonveridical, approximative semantics, which becomes veridical only by virtue of our pragmatic expectation that what is perceived would continue to be the case, were we to perceive more accurately. It is a general feature of resource bounded logics that the underlying logics are weak, but that stronger principles can be obtained pragmatically, by strengthening the resource. For the logic of vision this feature is clarified by showing how changes in the resource capture different notions of partiality, and by studying how the perception verb interacts with connectives and quantifiers in different visual contexts. The inference Veridicality, which is now viewed rather as a nonmonotonic inference, is also studied in depth. 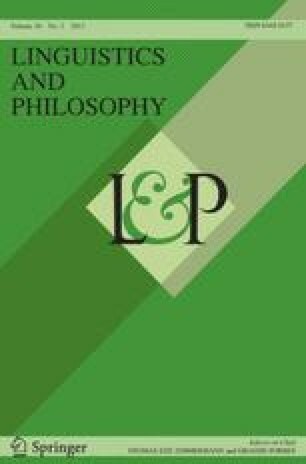 We end with an attempt to buttress the proposed model by comparing it with suggestions put forward in Cognitive or Conceptual Semantics, in the literature on evidentials, and in Husserl's philosophy of perception.